Marie and Arnaud de Cadier de Veauce are happy to welcome you in their family castle. 3 gorgeous bedrooms and one for an entire family are waiting for you, just like the little apartment "La Loge" which is situated in the defensive area of the castle, right in the middle of a huge park with old trees. The breakfast is served according to the season, in the living-room or outside. The castle is situated in the middle of the "Parc Naturel Régional Livradois-Forez", in the region of the "Puy-de-Dôme", where Nature is the Queen. 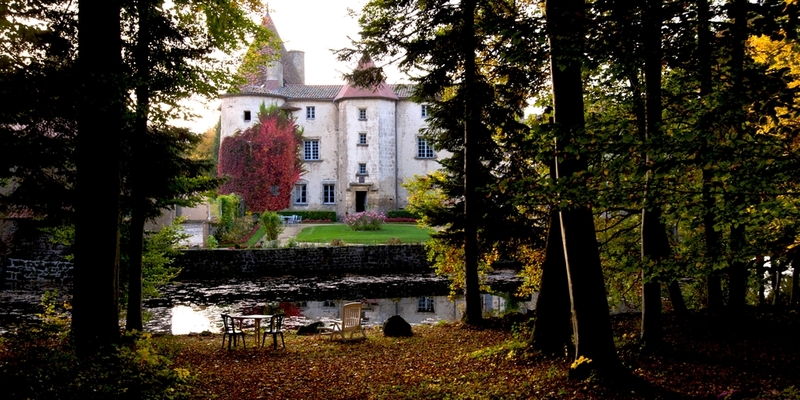 Our castle is at 40 minutes driving from Clermont-Ferrand, the capital of "Auvergne". Le Château des Martinanches is located in a region called "La Toscane d'Auvergne"
This region includes different cities like Clermont-Ferrand, Theirs, Ambert and Issoire, whose name had been formed thanks to the Queen Catherine of Medicis and her daughter the Queen Margot who was a prisoner in "Auvergne" during the XVIIth century. The landscapes calm and full of poplar trees remind us of the Italian region of Tuscany. Situated somewhere between the Forez mountains and the volcano Puy-de-Dôme, the region offers an interesting choice of activities. In order to discover the variety of landscapes and all the typical villages, a lot of rides are possible, they are called the "ballades de l'environnement". You can walk, ride a bike, ride horses or even donkeys, and there are also aviation activities. "L'Auvergne" is famous for her volcanos, her lakes and you can follow her castle historical road, whose one has been used for the movie "Les Choristes". Her museums, her gardens, her craft workshop and her delicious cheeses road will amaze you !